The Enneagram Type 3 Achiever or the Performer has the true world values of a victor. You are the one who does his or her best to be the true winner. You do not like losing at any cost and are ready to do anything to be at the top. You like being the center of attraction and in the limelight for all your achievements. You do not believe in doing things halfway but will push yourself to give your best when it comes to accomplishment of goals. 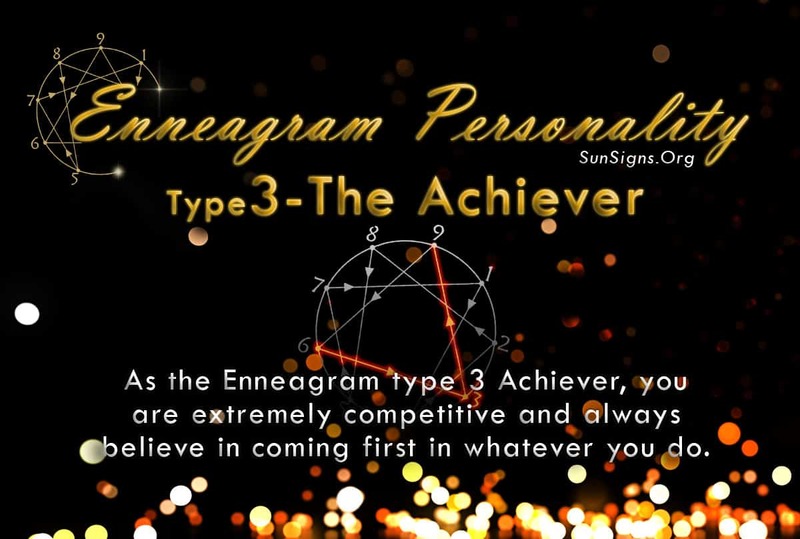 The Enneagram type 3 personality are extremely competitive and always believe in coming first in whatever they do. You are a very image-conscious person and deeply concentrate on whatever you are occupied with at the moment. Since your basic desire is to be appreciated by others, your basic fear is that of being rejected. You are a person who spends a long time working on a project until it is successfully completed, so that others are forced to give you credit for doing such a wonderful job. This makes you the happiest person in the world. You are a very modest and straightforward person. Benevolence and charity come naturally to you. You make an excellent romantic partner and your lover is likely to find you gracious and charming, and able to shower enough love upon him/her. But you really excel in the professional sphere, where the taste of success is what you crave for. At work, you are obsessed with your own performance, and strive diligently to obtain really high standards. With this kind of attitude, most of you are destined to succeed. One really interesting feature about you in this regard is that you can mould yourself perfectly with the expectations of others, and work in accordance with their long-term aims and wishes. This automatically makes you the Boss’s ‘Blue Eyed Boy’,(in case you are not already the Boss!). The best thing, which helps you in your path to success, is your self-confidence, and the fact that you believe in yourself as a person. Your dedication to work, perseverance of character and strong idealistic values, make you a true chart topper, and others are tempted to follow your chosen path. This makes you an automatic leader of people. It pains the Enneagram type three person the most when someone says you have failed to do a good job. Therefore, you wish to avoid failure at all costs. The fear of rejection can often make you very competitive in the workplace. Worse, it might lead you to become resentful of others and hostile towards everybody around you. Others may then find you in a really bad mood! It will thus do you a lot of good if you try and be less competitive. Just concentrate on your own individual improvement and you will automatically earn the admiration of others. However, again you need to exercise a note of caution. Being a person obsessed with success, this might make you manipulative, as you covet the success of others. You might be tempted to take false credit for the work of your subordinates, and yet be morally unconcerned about it. People like you may have an egoistic streak about them, and tend to have grand and often illusory notions about themselves. You might try to put down a certain person at work, if you feel the concerned individual is brighter than you are and has a better chance of success. Ruining a person’s happiness is certainly not a good thing to do and so these are tendencies that the Enneagram type 3 person should certainly try to control. An Enneagram test can help you analyze yourself better.